While I was in New York City for the New York Comic Con last weekend, I met a friend of mine for lunch. Accompanying her was her new fiancé, a really cool guy who’s lived and traveled all over Asia. All over Asia except for Japan, that is. He said that, based on the Japanese movies he’s seen, he’s a bit afraid of Tokyo. It seems too big, and too modern, and too noisy – hyperkinetic and almost like science fiction. I asked him what Japanese movies he’s seen. Akira and Lost in Translation, he told me. I think that, for a lot of people who are familiar with Japan but haven’t actually been there, Japan exists not as a real place where real people live but rather as some sort of strange and exotic fantasy land called “Japan.” For some people, “Japan” consists of towering skyscrapers and flashing lights and all-night karaoke rooms, while for some people “Japan” is all about green mountains and cherry blossoms and Zen temples and tea houses. There is a touch of good old fashioned Orientalism at play here; but, then again, Japan actively markets itself in such a way as to encourage these assumptions, even domestically. Furthermore, the fantasy of “Japan” is perhaps not so fantastical – places like the 109 Building in Shibuya and the Philosopher’s Path in Kyoto really do exist. In the end, though, Japan is a real place where real people live, and it’s not any more beautiful or ugly or modern or rural than, say, New Jersey. 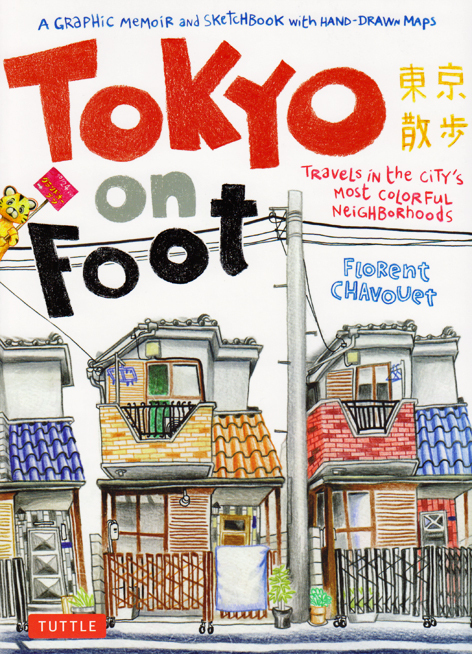 What I love about Florent Chavouet’s Tokyo on Foot is that it visually depicts Tokyo as a real city with many, many faces. Yes, there are huge buildings and busy intersections in West Shinjuku, but there are also tiny restaurants and old houses on the verge of falling apart in West Ikebukuro. And then there’s everything in between, from architectural oddities in Ueno to cute little bars in Daikanyama to Shintō shrines nestled between skyscrapers in Takadanobaba. Chavouet draws them all beautifully. Tokyo on Foot is divided into neighborhoods, with each section opening with a drawing of the local kōban (police station) and a highly detailed annotated map. What follows this map are several pages of drawings of buildings, street corners, storefronts, landmarks, and occasionally people that the artist observed in the neighborhood. Most of these drawings occupy a full page, and all of them are in high-contrast full color. Chavouet’s drawings of people are caricatured, and his drawings of buildings and objects are almost photorealistic, but all of his subjects receive the same careful attention to detail. Chavouet’s medium of choice is colored pencils, and his pencil work really brings out the colors and textures of everything he draws. Really, it’s gorgeous. Chavouet often accompanies his sketches with annotations. He’ll make small notes concerning the weather, how he got to a certain location, and what interactions he had with the people who watched him drawing. He’ll also include small cultural details, like the fact the Mr. Donuts offers free coffee refills. In each section, there is usually at least a page or two of smaller sketches illustrating concepts like the vast insect population of Tokyo or how to make a disco lamp using cheap materials from Tokyu Hands (“like Target, only better”). There is occasionally political commentary as well, such as when the artist draws the heads of conservative male politicians attached to the bodies of young women in bikinis or mocks the nonsense spewed by the right wing campaign trucks that tour the streets of Tokyo (“Down with kisses and TLC, long live war and mean people”). In a scattered and roundabout manner, Chavouet also turns a satirical eye on the police officers who repeatedly harassed him for parking his bike in the wrong place and/or loitering (in other words, staying in one place long enough to draw it). What Chavouet draws is a Tokyo that isn’t some futuristic (or idyllic) alien city but rather a city where people live, work, drink, smoke, have trouble finding parking, chill out in coffee shops to get out of the rain, hang out with their friends, sometimes act like assholes or creeps in public, take lunch breaks in the park, and all the other things people do in a huge urban area filled with millions of people. Through his pencil work, Chavouet depicts the beauty of the monumental, the grimy, the quaint, and the pedestrian. Rows of potted plants outside of someone’s house in a small back alley just behind a major train station can be just as calming and peaceful as a painstakingly manicured Zen garden, and telephone poles covered in posters can be just as awe-inspiring as Corinthian columns. I can’t wrap my head around how much I love this book. Get this book for yourself. Get this book for your hipster art school friends. Get this book for your mom who doesn’t understand why you care about Japan in the first place. And get this book for your friend’s fiancé who thinks Japan is exactly like Akira. At least, that’s what I plan on doing. By the way, if it seems like I keep returning to the theme of “Japan is a real place, where real people live,” it’s because I find myself increasingly frustrated with the persistence of othering and essentializing discourse on the country. I prepared for my first-ever trip to Japan, this summer, almost entirely by immersing myself in the work of Haruki Murakami. This turned out to be a horrible idea. Under the influence of Murakami, I arrived in Tokyo expecting Barcelona or Paris or Berlin — a cosmopolitan world capital whose straight-talking citizens were fluent not only in English but also in all the nooks and crannies of Western culture: jazz, theater, literature, sitcoms, film noir, opera, rock ’n’ roll. But this, as really anyone else in the world could have told you, is not what Japan is like at all. Japan — real, actual, visitable Japan — turned out to be intensely, inflexibly, unapologetically Japanese. In other words, an American goes abroad to a major international metropolis. The American doesn’t bother to learn any words or phrases in the native language beforehand, because he assumes that everyone will speak English. When the American arrives abroad, he realizes that, in fact, not everyone speaks English. He is extremely upset – wasn’t the foreign city supposed to be cosmopolitan? Why does someone like Sam Anderson (who is extraordinarily articulate and well read) get a free pass on ethnocentrism in a discursive space like the New York Times Magazine (which is supposed to be for smart people who think things like racism are bad) when it comes to Japan? Why does everyone get a free pass on ethnocentrism and cultural essentialism when it comes to Japan? For the record, Japan – “real, actual, visitable Japan” – does in fact have things like “jazz, theater, literature, sitcoms, film noir, opera, [and] rock ’n’ roll.” Yes, Tokyo is not New York City, and yes, Japan is not Spain or France or Germany, but it’s not some crazy mysterious non-Western Other, either. This is why I love Japan on Foot, and this is why I think books like Japan on Foot are so important. If I ever teach a class about “Japanese Literature of the City” (which I would very much love to do), Japan on Foot is going to be the first text on the syllabus. This looks like a wonderful book. I find Tokyo to be quite easy to get around by public transit in terms of station A to station B on the X line (even if Shibuya and Shinjuku stations made me want to cry the first time I went in there. So many lines and people and stairs….) I haven’t gotten to explore a lot of the neighborhoods other than 有楽町・日比谷, but Tokyo has so many great areas like Ginza and Mitaka that are not the iconic Shibuya. I very much agree that ethnocentrism and “I didn’t bother to learn anything about Japan before I went there and I was SO surprised that it wasn’t like I thought it would be” get far too many passes in otherwise sensitive publications. I think this happens with other Asian countries, too. Did you see David Sedaris’s horrible piece on China? And don’t get me started on how Tokyo =/ all of Japan. At Kanazawa Station, human beings still handle all the tickets at the gates. I’m sure that will change with the coming of the Shinkansen, but yeah. Japan might be more ethnically homogenous than other countries, but the country itself is not as homogenous as people think. Those drawings look wonderful. There’s something about these kinds of colored pencil guides…. Reminds me of a series of guides to kabuki with a similar colored pencils approach. Oh wow – that’s really, really cool! I love your blog. I read every one of your posts. Anyway, regarding cultural essentialism, I think you & I notice cultural essentialism of Japan precisely because we study/live here. This cultural essentialism happens across all travel writing, though, I’m afraid; I’m just less in tune to it regarding other cultures because I know less about the other places which appear in travel literature. I know nothing at all about Turkey, but if I were an ex-pat in Turkey, I’m sure I’d find that statement highly offensive. Unfortunately, many travel writers resort to essentialism out of necessity. If you only spend one to two weeks of your year thinking about and visiting “a place,” your brain cannot hold onto all of the corners of complexity that encompass it. So you grasp for stereotypes. Anyway, I am super-excited about this book, and think it will indeed be a good introduction to the many patterns of life which exist in Tokyo; I simply wanted to point out that Japan is perhaps not unique in being the subject of bad travel writing. Great post, and I’m glad you mentioned that NYT piece on Murakami in the comments. When the guy got lost on the subway I just kind of tuned him out as I read the rest of the article. Definitely going to have to pick up a copy of this book. Thank you for reviewing this! I got it on a hunch after reading your review and seeing the sample picture, and yes, not only is it the best Christmas present for at least 3 people (mostly everyone who has come to visit me in Japan over the years, really) – it’s also such a wonderful nostalgia trip it makes me almost cry. I am so happy that he starts off in 町屋 as I used to hang out at the Freshness Burger there (it was not far from where my apartment was). 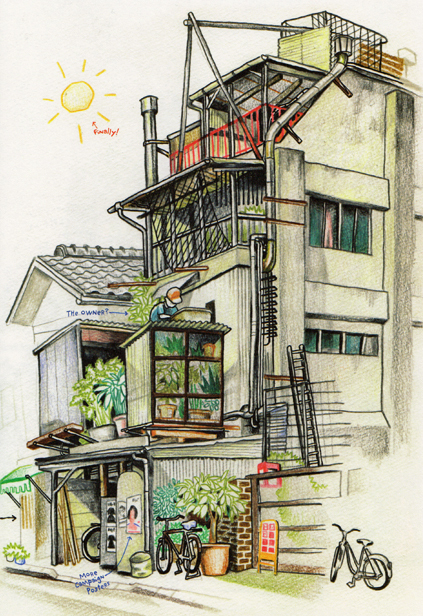 All the buildings are as he draws them. How funny. I love your blog!! Thanks for writing about this book as I had not heard about the book before today. I have ordered this and this will be my next read! !